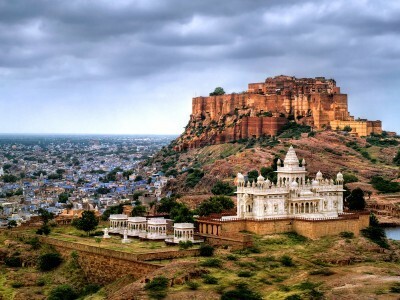 Jaisalmer, the "Golden City", is located on the westernmost frontier of India in the state of Rajasthan. Close to the border with Pakistan, the city is known for its proximity to the Thar Desert. 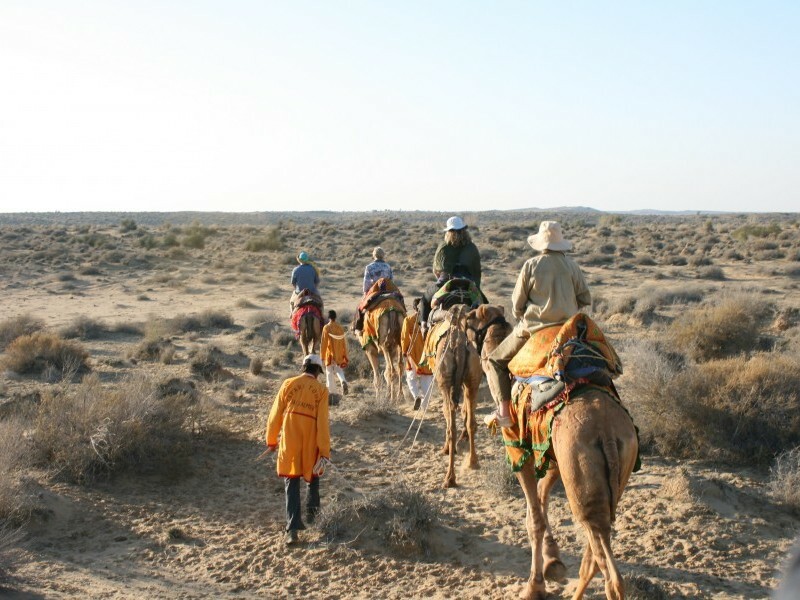 Desert Safari in the sand dunes of Jaisalmer is an unforgettable experience. 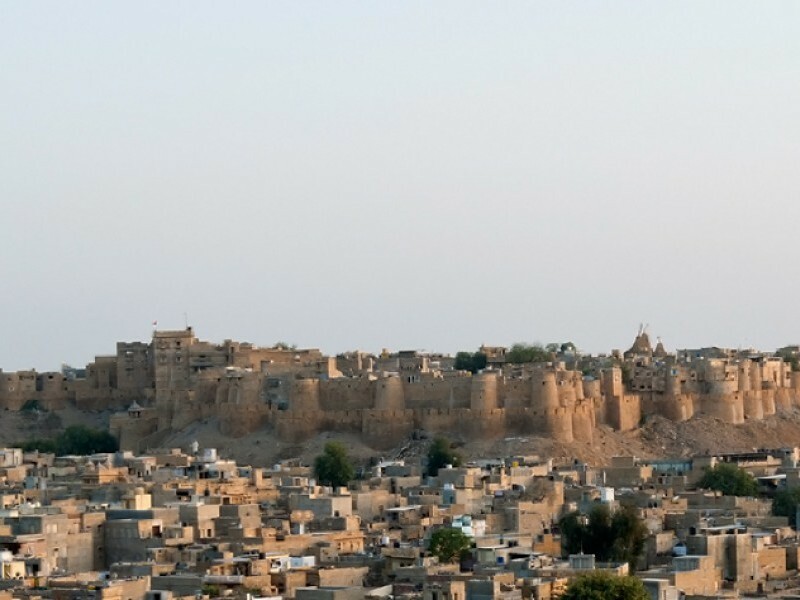 The city is dominated by the Jaisalmer Fort. 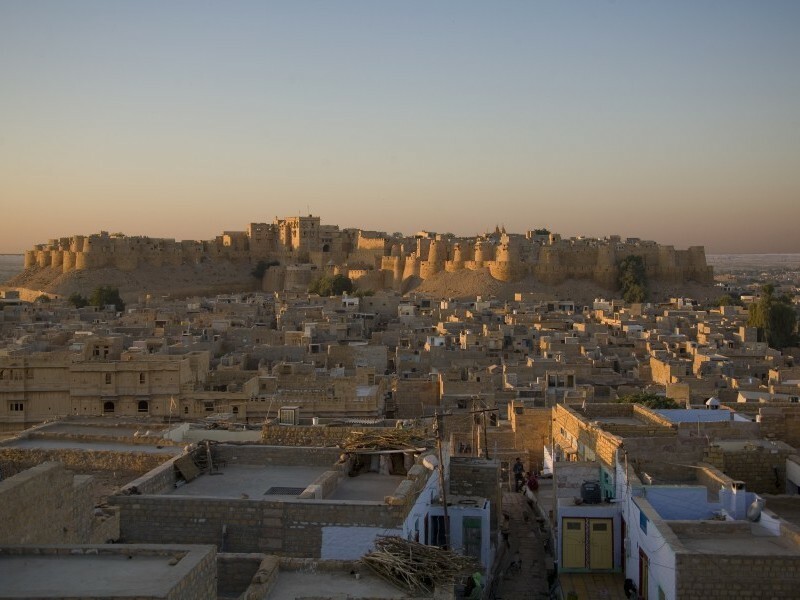 Unlike most forts in India, the Jaisalmer Fort is a living fort. There are shops, hotels, age old Haveli (homes) inside the fort area. Unlike Jaipur and Jodhpur, with populations in the millions, Jaisalmer is very much a tourist town, with a population of about 80,000. In fact, a significant portion of the population is only there in the tourist season, 4 months out of the year. The rest of the time they go off to find work in larger towns in Rajasthan. Thus you can expect to see that the inhabitants are very intent on selling you things. It is a rainwater lake which supplies water to the city. It is surrounded by temples and tombs of saints. Boat rides are offered. Nearby is the desert cultural center and a local museum built out of the collections of a local schoolteacher Mr. N.K. Sharma. This center conducts puppet show in the morning and evening. There are people who will try and sell you bread to feed the huge number of catfish in the lake. Jaisalmer fort is also known as the “Sonar Quila”. Colorful shades of the setting sun and golden hues of the desert ambience give a fairy tale look to this mega structured fort. The interior of this fort is amazing. It is a 'working fort' meaning that unlike every other fort in India, there are people living and working within its walls. Tourists can also visit many havelis of rich merchants, which are also having a touch of great classical interior and design. There are numerous lookouts (at least five) within the fort that give a great view out across the city and desert. A tour of the royal section of the fort is available from a starting point just to the right up the stairs as you enter the main square of the fort. The audio tour takes about one hour and 15 to 30 minutes. At the final few sections, there are 2 advertisements in it - not a must; the view is what you come for. It is however not possible anymore to opt out of the audio tour, it is included in the Rs 300 ticket. They do charge Rs 100 extra per camera. There's little you'd want to take a photo of except the view from the roof, the highest part of Jaisalmer. There are 7 beautifully curved temples built inside the fort walls. These temples were built in between from 12th century to 15th century. All the temples are connected by walkways and corridors. It is compulsory to remove your shoes and all other leather articles (belts, wallets, purses etc...) before entering the Jain temple. The very first temple which a tourist can visit is dedicated to Chandraprabhu, who is the eight tirthankar (Jain God). The symbol of the God Chandraprabhu is the moon. This temple was built in 1509. It is built with fine stones. They are only open from 8am to Midday - and leave a good hour to see them. Entry is Rs 150 (including camera). Take your shoes off and leave them near where you bought the tickets (a tip is only half expected). Patwon-ki-Haveli in particular, located a ten minute walk from the main gates of the fort, is quite magnificent. It's a collection of five houses, each one for the son of a wealthy trader who made money lending to the government. One of the Haveli's (closest to the street) has been restored and turned into a government museum. Expect to spend two hours there. Great view back towards the fort. Entry Rs 120 (foreign tourist). Guides wait around outside and offer their services for as little as Rs 50, however they offer a rushed guide and there is plenty of information on signs inside. A Camel Safari is great fun, especially when combining riding and walking side by side with your camel ¬ at your own pace; this way you can enjoy both, relaxing riding and refreshing bone stretching. It is obvious that the longer you choose to go on your safari, the more remote places you will see and the more you may adjust to and enjoy the desert tranquility. 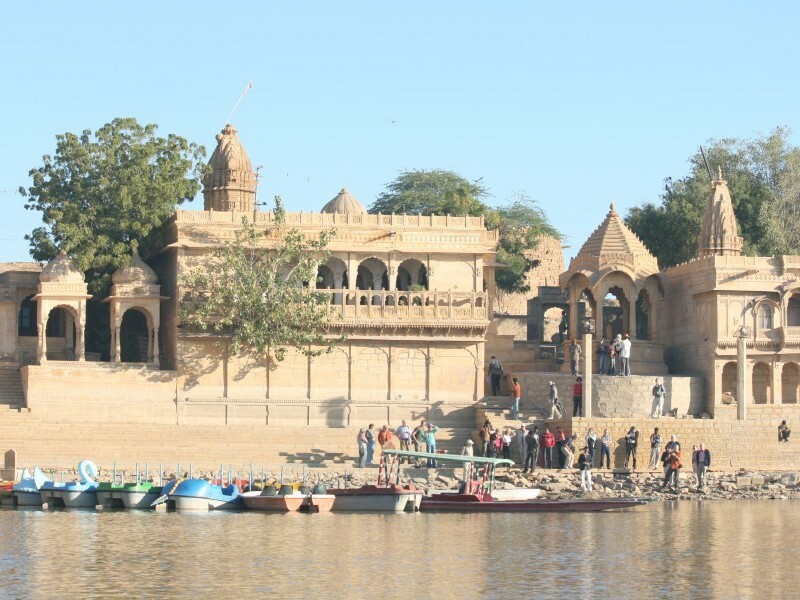 Just chill, Jaisalmer is a lovely and very relaxing place with a great small-town feel. Plan at least two days and add time you want to have in the desert. Go for a stroll, visit the palace and do the camel safari. If you do not feel remotely attracted to camels, try a jeep safari into the desert to see the scenery and watch the sun go down. Below the fort are several magnificent havelis with intricate stone carving. Several can be visited for minimal charges and are well worth seeking out. It is more comfortable to wander in the city before 9 am when there is not many tourists, less shops opened/hassle and still fresh air. From here you can get cheaper camel rides and easy access to sand dunes. 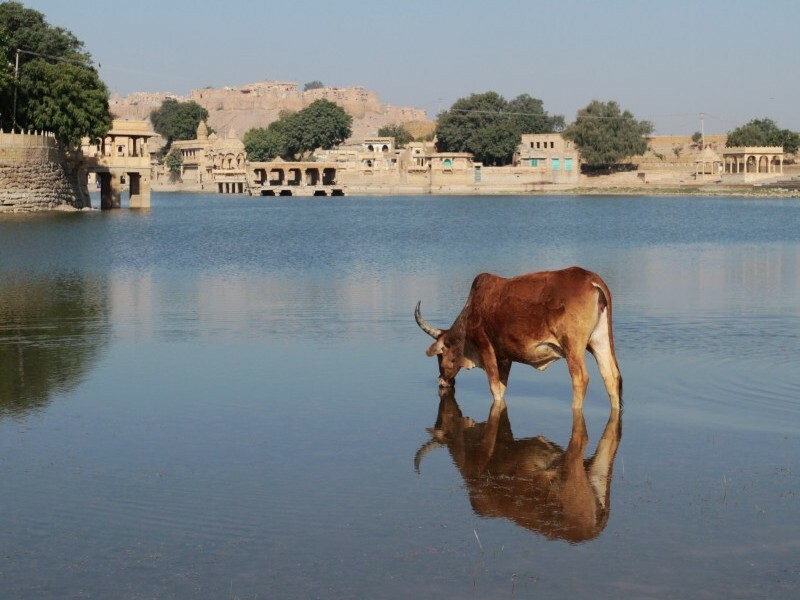 Let one of our tailor-made holiday experts help you plan a personalised Jaisalmer experience as per your budget and requirements.